Austin, TX, February 19, 2016 --(PR.com)-- On February 19, DogsBite.org, a national dog bite victims' group dedicated to reducing serious dog attacks, releases its 2015 annual dog bite fatality statistics. Last year, dogs inflicted 34 deadly attacks in the country. 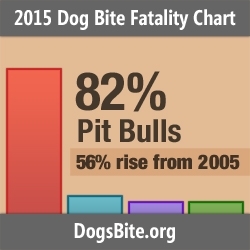 Pit bulls contributed to 82% (28), the highest death count recorded for the breed and a 56% (18) rise from 2005. 82% is the highest percentage of deaths inflicted by pit bulls in a single year in the nonprofit's 11-year data set (2005 to 2015). DogsBite.org is a national dog bite victims' group dedicated to reducing serious dog attacks. Through our work, we hope to protect both people and pets from future attacks. Our website, www.dogsbite.org, was launched in October 2007 and contains a wide collection of data to help policymakers and citizens learn about dangerous dog breeds. Our research focuses on pit bull type dogs. Due to selective breeding practices that emphasize aggression and tenacity, this class of dogs negatively impacts communities the most. Our website hosts important dog bite studies, U.S. dog bite fatalities and other key bibliographies. In the Legislating Dogs portion of our site, we offer examples of breed-specific laws (state-by-state) and documentation of the constitutionality of these laws. The Victim Realities section provides a glance into the unforgettable histories victims leave behind and much more. DogsBite.org operates out of Austin, Texas and can be contacted via: 512-650-8510 or press@dogsbite.org. Research contributions and active website participation stems from individuals that span the United States of America and across the world.